In 1997 Chuck was asked to create illustrations for the four operas being performed that season by Opera Pacific using the Warner Bros. characters. 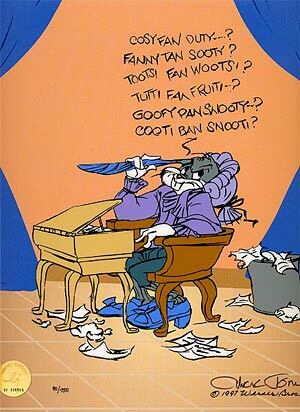 From his drawings, limited edition cels were created of scenes from “The Mikado” starring Tweety Bird & Sylvester; “La Boheme” with Bugs Bunny, Honey Bunny and Wile E. Coyote; “Tosca” with Wile E. Coyote and Honey Bunny; and “Cosi Fan Tutte” with Bugs Bunny as Mozart. Learn more about Cosi Fan Tutte. This fine art Hand Painted Limited Edition Cel was created from an original drawing by Jones. Each work of art is hand signed by Chuck Jones.